Been off the Blog for a few days but not off the patch! Been up to Gilroy every day bar Thursday. I like to think I'm an all-weather birder and I have been out in some pretty fierce conditions but I'll admit to being rained off every now and then! It didn't stop me thinking about it though, and after a stupid bit of banter with a mate we have come up with a name for our Wood Sandpiper. Breeding close to water at the edge of boreal forests (sometimes in old Fieldfare nests) I can imagine it in a Spruce tree. Making a huge journey to winter in Africa I can imagine steam coming off it's wings after a strenuous leg of this mammoth trip. Making it Spruce Wingsteam. Idiot! Wednesday night was a cracking night. The light was amazing and ON-OR colour ringed Godwit was reported earler in the day. So off I go. As I pass the tip on Greenbank Road I see a big flock of Godwits flying over Grange Hill towards the Estuary! But a trip to Gilroy at the moment is never wasted so I pedal on undeterred. When I arrive the flooded field is bathed in a lemon light that makes everything vivid through the telescope. There are stll a handful of Godwits feeding in the water (no sign of ON-OR) and Spruce is busy on the far side. There are more Snipe than yesterday. 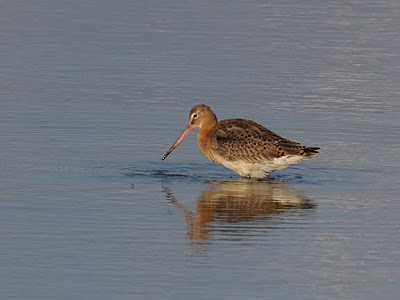 The Godwits are wading belly deep and immersing their heads in the water, the Snipe probe in the mud at the edge and Spruce is dashing around taking prey from the surface. A juvenile Pied Wagtail is sitting on a log in the water. There are 11 Snipe that I can see. 9 feeding in the open and 2 skulking in the grass on the bankside. 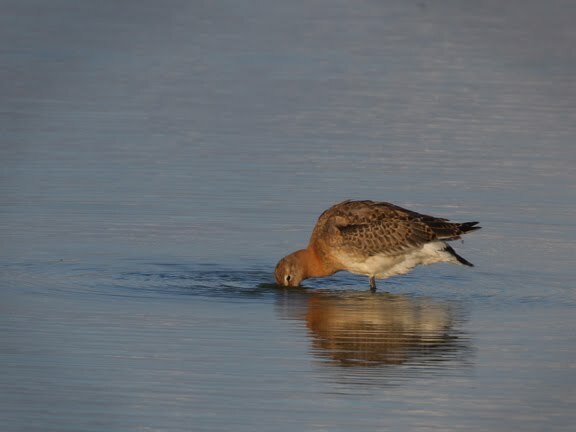 A Godwit wanders closer and I get a few frames of it feeding. Muddy water flies off it's bill as it throws it's head back. The light makes the orange plumage look firey. A fellow Estuary watcher appears and we have a good chinwag about birds on the Dee and life in general until it is time to head home for tea. Friday is crazy busy at work, there's a photpgraphy course and plenty of visitors to contend with so it gets to 2.30pm and I haven't stopped for a bite to eat yet. This turns out to be a blessing in disguise as I get a text with some exciting news...... A new colour ringed Godwit has dropped in at Gilroy! So that is lunchtime sorted. I grab the optics and a pasty that has clearly be out of the fridge for far too long and zoom off. I get there and set up the scope and start scanning the flock. It has moved to the Gilroy Road side of the pool. This means they are closer but standing in the long grass! Hard to see ringed legs. I'm lucky though and the new bird is visible. I have to wait for it to move from between a couple of Canada Geese so I can get all four rings. I keep watching it as I scoff the luke warm, pocket-crushed pasty getting crumbs in the eyecup of the scope. Idiot! A final scan finds Spruce feeding in it's usual haunt at the far side. All too soon I'm back off to work, but I'll be back on the trail of GN-LO as soon as poss! LOL and I thought it was a pun on Bruce Springsteen!